Vincent Female Fuzzy Kiwi (actinidia deliciousa "vincent") - Delicious egg shaped fruit commonly available in grocery stores are very sweet and contain high amounts of vitamin C and other antioxidants. Female Vincent will need a male pollinator "Tomuri" to produce fruit. 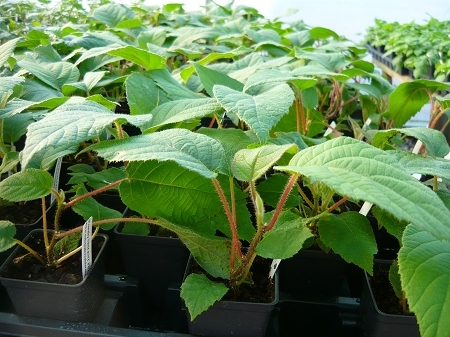 Fuzzy kiwi are easy to grow in temperate climates, not fussy about soils, though it does prefer a well drained location and not to sit in wet soils. Very productive vine will need a strong supportive trellis as yields can reach up to 100 pounds of fruit annually. Usually bears in it's second or third year. Very heat tolerant and cold hardy to about 15 degrees. Requires 150 -300 chill hours to fruit. Perennial zones 8-9. Live starter plant in 3 inch container.